You guys, even amongst all the glamorous gowns, Miley Cyrus’ looks tonight are some of my all-time faves. She went with a more laid-back look on the carpet, and something similar during her song with Shawn Mendes, and if I had to choose, Miley Cyrus’ 2019 Grammys performance outfit is my favorite of the two. Cyrus showed up tonight serving beachy hair, edgy attire, and a smile, and that last part was honestly the most beautiful thing about her look. Seriously, Cyrus seemed to be in high spirits, and she’s been hyping up working with Shawn Mendes all week, so we know she was excited to join him in singing his hit, "In My Blood." And while this is one of my favorite "headphones in, driving while it rains, leaning my head against the window" hits, the vibe felt more rock and roll than somber during their performance, as the duo was really rocking out! Cyrus definitely went for that old-school rockstar vibe with her outfit, and paired messy waves with the most ballsy take on a suit I’ve seen in quite some time. Slay, girl, slay! Cyrus paired all-black brocade-patterned trousers with a matching vest-style top, held closed by a mere gold chain linking two bedazzled buttons. She also loaded up on jewelry, including tons of gold and silver chains on her neck and both wrists. Don’t get me wrong, this look is fire flames hot. But I admit that I was very, very nervous about that little gold chain holding things together. Can you blame me for anticipating a nip slip just waiting to happen? Fortunately, Cyrus rocked out to her heart’s content and her look remained PG. Like I said earlier, she always looks gorgeous, but IDK, man, something about her glow tonight was particularly radiant. Even in grungy gear, Cyrus shone like a diamond in the rough, and the look was as flawless as the performance itself. The coolest part about this performance attire is that I really didn’t see it coming. Cyrus has posted numerous shots of herself singing with Mendes over the week, and she’s rocked completely different vibes in every shot. She can pull off anything, that’s for sure! But I love that she went really bold with her performance look tonight, without going 2013 VMA performance bold, if ya know what I’m saying. This shirtless suit fit oozes cool, but in a sophisticated, statement-making way, and it definitely fits Cyrus’ vibe as of late. 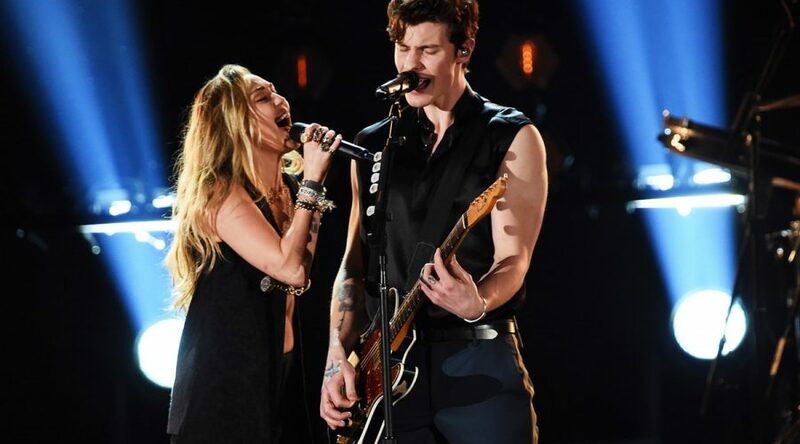 Congrats to Miley and Shawn on great style and a great performance!